Most children love to help out in the kitchen, but many parents are nervous about cooking with kids. Author and entrepreneur, Barbara Beery, takes some of the mystery out of the process. Barbara Beery combined her two loves-- children and cooking-- and made it her mission to get children involved in cooking from a young age. In cookbooks such as Batter Up Kids: Sensational Desserts and Batter Up Kids: Sensational Snacks, Barbara offers fun, easy-to-follow recipes of foods kids will actually eat. Each recipe has an accompanying colorful photo. At Batter Up Kids, Barbara takes an even more hands-on approach to teaching cooking. Batter Up Kids offers fun and interactive cooking classes for children as young as two. LoveToKnow (LTK): Tell us about Batter Up Kids. What led you to start this business? Barbara Beery (BB): I started the business back in September 1991 to earn extra money while I was teaching preschool so that I did not have to teach full time in a public elementary school and put my three children in daycare. With my degree in elementary education and a passion for cooking, it seemed a natural extension of my two talents and passions...working with kids and cooking. LTK: What is a cooking birthday party? BB: We offer parties (all kinds-- not just for birthdays) for children turning 3 and up to 16. Parties include lavish party favors for each attendee, and a special birthday gift just for the guest of honor! The "main event birthday party" is a highly interactive and totally "hands-on" prepping and cooking extravaganza! Every cooking birthday has a theme (a child and parents choose from an extensive list). The cooking elements are built around that theme as children interact in the creation of each dish made at the party. A grand presentation follows the cooking session, as the attendees are graciously served the delicious items they "cooked-up" during the class. The birthday child may even choose to open gifts as her grand finale! The end of every celebration brings attendees their themed party favor baking kits as visions of scrumptious memories dance in their heads. Fun for your child and fun for you...Who could ask for anything more? LTK: How can parents encourage healthy eating habits from the beginning? BB: Get them into the kitchen and involve them in the process of choosing what to fix for snacks and treats, take them to the grocery store when possible, get them to local farmers markets, INVOLVE them at an early age. Kids love the kitchen; it is the parents most often who are scared to cook! LTK: In the case of kids who have already developed unhealthy eating habits, what can be done to change that? BB: Most of our kids, unfortunately, develop unhealthy eating habits because of the way we, as Americans, think of eating and cooking...way too many "lunch-able" types of products, which are brainless and expensive to use. But most often this is what a child's lunch consists of unless they are lucky enough to drive through a McDonald's! So, fresh fruits, fresh veggies presented in a fun, clever way. Use what is in season and whole wheat tortillas and pastas. Nothing we all haven't read or know, but parents need to begin this and once again , use clever recipes and involve the kids in the process. This is where change begins and ends. LTK: What advice do you offer parents dealing with picky eaters? BB: Keep trying and keep offering different items. Give them foods they love and integrate those they do not. Cheese dip can be laced with bits of broccoli and cheese pizzas may use the same tricks! Get cooked veggies ( which kids least like) mixed into rice, pasta, or mashed potatoes. Serve small portions to try new things and do not demand they finish...simply "try" a taste. LTK: Besides cooking, what do kids learn by being involved with food preparation? BB: Everything there is to learn. All the academics...reading, which includes comparison and contrast, math and sequencing skills, science including prediction and outcome skills. Cooking builds self-esteem and is non-competitive and a skill to take with them the rest of their lives. 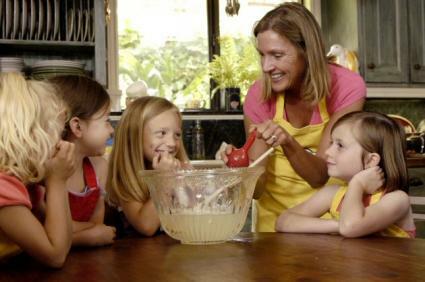 LTK: At what age are kids ready to start getting involved in the kitchen? BB: About two and a half. LTK: At what age are kids ready to cook unsupervised? BB: This is a loaded question. Kids that have experience in the kitchen are ready as early as 10, but they should always have an adult in the house close by. Generally speaking, around age 12-14. It's so very contingent upon their skill levels and experience with appliances. My youngest daughter was fixing a complete breakfast with waffles, bacon, and eggs at nine, but she had been cooking for two years at that point. My 20 year old son still may not be safe in the kitchen! Visit Batter Up Kids for information about kids' cooking classes and franchise opportunities.